Major media headlines on controversial or unusual inclusions in an individuals Last Will and Testament often make readers reassess their own wills, or to write one for the first time. This has happened for well over a hundred years, and a particular Will written in 1909 by D.C. resident Robert G. Dyrenforth made sensational headlines in the local papers the following year, and was no doubt the hot gossip that summer. Divorced in 1902, the contents of his Will revealed a streaming discontent with his former wife and the female gender as a whole, and set a multitude of impossible challenges for his only heir, a grandson by the same name. Robert St. George Dyrenforth was listed in the 1890 City Directory as a resident of a house coined “Laurelwood” in Mount Pleasant. By 1896, however, he was listed along with his wife Jennie in the Elite List as a resident in a house at 1503 Rhode Island Avenue, N.W (replaced by a Holiday Inn today). He listed himself as a patent lawyer, and as the “Commander-in-Chief” of the Union Veterans’ Union, with an office at 602 F Street, N.W. He also was rather infamous for his attempts to create artificial rain. They later moved to a house at 1311 21st Street, N.W., where he would live until 1907. Divorced wife Jennie moved into 1606 19th Street that same year. Dyrenforth had been born in Chicago, Illinois on October 17, 1844. 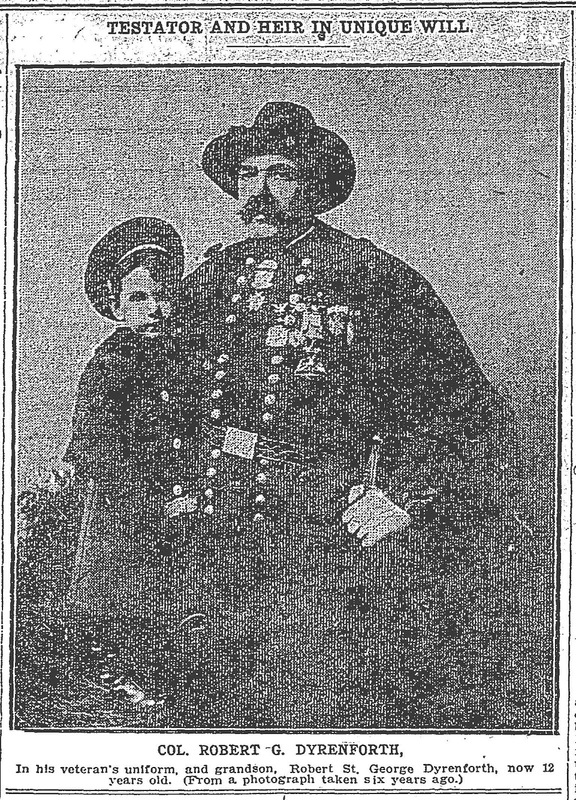 He was a cadet at Breslau, Neisse, and Berlin, Prussia from 1857 to 1861. He graduated in electrical engineering from the Polytechnic school in Carlsruhe, Baden, and from the University of Heidelberg in 1869, with a Ph.D. He attended law school and other programs at the Colombian (George Washington) University. He had served in the United States Army for the Civil War, leaving service in the rank of Major. 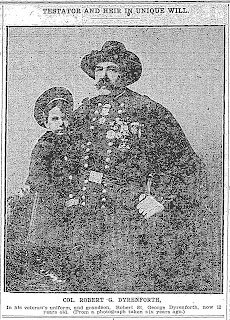 Once described as a flamboyant character, he served as a War correspondent for the Chicago Post and Times during the Austro-Prussian War in 1861, and entered service in the Patent Office in 1871. He rose to the rank of Principal Examiner, before practicing as a patent and corporation lawyer beginning in 1885. He had married Jane “Jennie’ De Lacy in 1866. They had four children together, including Bessie, who married Robert McGrath. They had a son, and named him Robert St. George Dyrenforth, Jr., after his grandfather. McGrath tragically died in 1899, when Robert Jr. was just 12 months old, and Bessie died just a year later. In the meantime, Jennie, a Catholic, had obtained a then rare legal separation from her estranged husband, and had alimony set in the amount of $50 per month beginning in 1902. She moved to 1606 19th Street in 1907, with daughter Rose, while Robert moved from apartment to apartment with their son Donald, and his orphaned grandson, Robert, Jr. 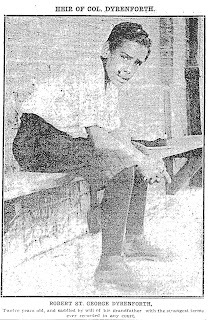 Unhappy Grandson Robert Dyrenforth, Jr.
Robert Jr., did not go willingly, however, because he had been abducted from a nurse during a stroll in DuPont Circle by Robert Sr., in 1904. 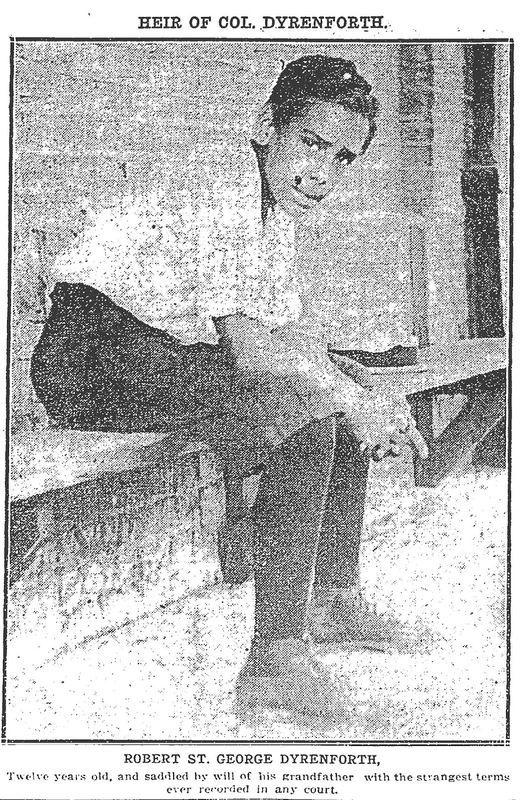 Jennie Dyrenforth later told The Post that “his grandfather turned him on me, as the affection years before was lacking.” Courts later granted his wish to adopt his grandson. Robert Dyrenforth, Sr. also included a single page, typed addendum to his will that was entitled “Instructions as to the Education of Robert St. George Dyrenforth” in which he spelled out seemingly insurmountable tasks, training, travel, and military duties for his son to obtain in order to achieve the estate on his twenty-eighth birthday. It is reproduced here. The Washington Post carried a series of articles and pictures from the time of probate in July of 1910. His separated wife Jennie is described as “a nervous wreck,” and noted that Robert was then only age 12, and had never attended High School – He was instructed to graduate just two years later, and attend Harvard. He was “far from being rugged,” she said, and she attributed rigorous violin and piano teachings under his grandfather’s guise having led to a prolonged case of Typhoid fever. After reading such a Will, one might wonder just what kind of man Dyrenforth was. It turns out he was far more boastful of his accomplishments that often turned out to be untrue, such as his using ranks such as Colonel and even General to precede his name, even though he was apparently kicked out of the Army at the top rank of Major. And his published Will was not the only scandal in his life. “Everybody complains about the weather, but nobody does anything about it,” Mark Twain once said; but he apparently never met Robert G. Dyrenforth. He set out to make a fortune in creating ‘natural’ rain in Texas in 1891. He was no doubt influenced by the 1890 publication of War and the Weather by Edward Powers, which contended that rain was caused by the concussions of loud noises, such as produced by cannons or thunder. Congress spent over $20,000 testing the explosion theory, to be supervised by none other than ‘General’ Dyrenforth. 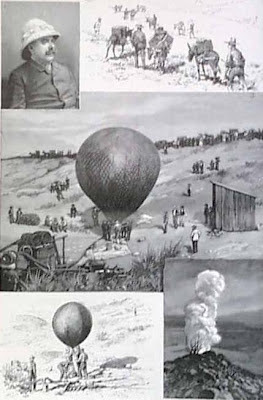 He set up a series of 68 highly explosive balloons filled with hydrogen and oxygen, and blasted away at the skies with 60, six inch mortars fired from cannons and 100 kites carrying sticks of dynamite. Media reports with the successful results went out across the country, and Dyrenforth was famous. For awhile. Dyrenforth had authored a column in the October, 1891 issue of North American Review entitled “Can We make It Rain?” and a full-page illustration from the October 10, 1891 issue of Harper's Weekly highlighted the experiment (right). Reports of the success were false, however, and the expensive test had produced no rain. One observer wrote, “[Dyrenforth] attacked from the front and rear, by the right and left flank. But the sky remained clear as the complexion of a Saxon maid.” Robert and Jennie returned to Washington, and attempted to fade from the controversy. Later articles in the Post indicated that Dyrenforth’s brothers did not probate the Will, and Jennie eventually inherited the estate, which Robert Sr. had vastly overblown; it included a tract of land in Mount Pleasant then worth between “$30 and $35,000,” but which had $22,000 worth of encumbrances on. Robert Jr. was described as to “be glad to escape the encumbrances of the Will,” and headed to Europe. Jennie obtained legal guardianship of Robert Jr., from the Illinois courts, with her in-laws apparently quite understandable. Jennie Dyrenforth and her daughter moved to 2021 O Street by 1913, and she died in 1926.